Where to find Fayetteville hotels near an airport? Where can I find hotels in Fayetteville that are near tourist attractions? Going to Fayetteville? There's a wide selection of accommodations for travelers to choose from. Expedia's extensive database lists 41 hotels and apartments that are within a 0.1-kilometre (0.06-mile) radius of Fayetteville's downtown. The Regency Inn Fayetteville/Fort Bragg is a sought-after hotel choice as it's located so conveniently to Fayetteville's heart. With 5 Expedia-registered hotels, Spring Lake is the neighborhood with the largest selection of Fayetteville accommodations. Spring Lake is around 15 kilometres (10 miles) from downtown. Spring Lake places to stay include the Country Inn & Suites By Carlson, Fayetteville-Fort Bragg, NC and Hampton Inn and Suites Spring Lake. If you're traveling on a budget, you will be delighted to know that there's a decent range of cheaper accommodations in the vicinity of Fayetteville. 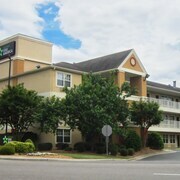 5 kilometres (3 miles) away from Fayetteville's heart you'll find the Extended Stay America Fayetteville - Owen Dr.. The Comfort Inn Dunn is just 35 kilometres (23 miles) away. The Quality Inn and the Microtel Inn & Suites by Wyndham Lillington are two alternative lower priced places that are worth a look. 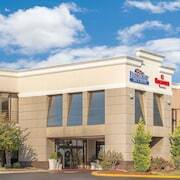 8 kilometres (5 miles) from the middle of Fayetteville, is the Embassy Suites Fayetteville/Fort Bragg. 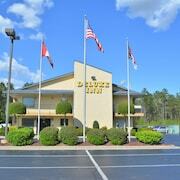 Alternatively, the Residence Inn by Marriott Fayetteville Cross Creek can be found 8 kilometres (5 miles) away. Alternative Expedia-listed accommodation options include the Holiday Inn Express Fort Bragg and the Hilton Garden Inn Fayetteville. The larger Eastern Piedmont area is well worth visiting as well. Enjoy Eastern Piedmont's tablelands. You could also explore a few of the region's historic mansions. In this region of United States of America tourists can partake in cycling, shore fishing and swimming. 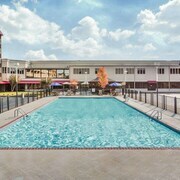 Cary is 80 kilometres (51 miles) to the north of Fayetteville and is home to the Cary Towne Center and Crossroads Plaza. Expedia-listed Cary hotel options include the The Umstead Hotel and Spa and Embassy Suites Raleigh - Durham/Research Triangle. Alternatively, you could stay in Chapel Hill, 95 kilometres (60 miles) to the north of Fayetteville, where you'll find the The Franklin Hotel Chapel Hill - Curio Collection by Hilton and The Carolina Inn - Destination Hotels & Resorts. The University of North Carolina and Morehead Planetarium are some of the most popular sites to see in Chapel Hill. If you are arriving or departing through Fayetteville Regional Airport, you may find it convenient to stay at Red Roof Inn & Suites Fayetteville – Fort Bragg, or Ramada Plaza Fayetteville Fort Bragg Area, both of which are a short ride away. What are the most popular Fayetteville hotels? Are there hotels in other cities near Fayetteville? What other types of accommodations are available in Fayetteville? Explore Fayetteville with Expedia.ca’s Travel Guides to find the best flights, cars, holiday packages and more!